We have today published the first research report to ever establish a link between literacy and life expectancy in England through health and socioeconomic factors. Literacy and life expectancy is the first in a series of reports that will be launched throughout our 25th anniversary year to establish why literacy is more important in 2018 than ever before. To uncover the depth of the relationship between literacy and life expectancy, we conducted fresh analysis of ward level data which we developed with Experian on the communities at the greatest risk of serious literacy problems, and ward level life expectancy data from the ONS and Public Health England. The research found that children born into communities with the most serious literacy challenges – who are more likely to live in deprived areas, do worse at school, be less financially well-off and have poorer health – have some of the lowest life expectancies in England. Furthermore, the charity found inequalities between wards in the same local communities. 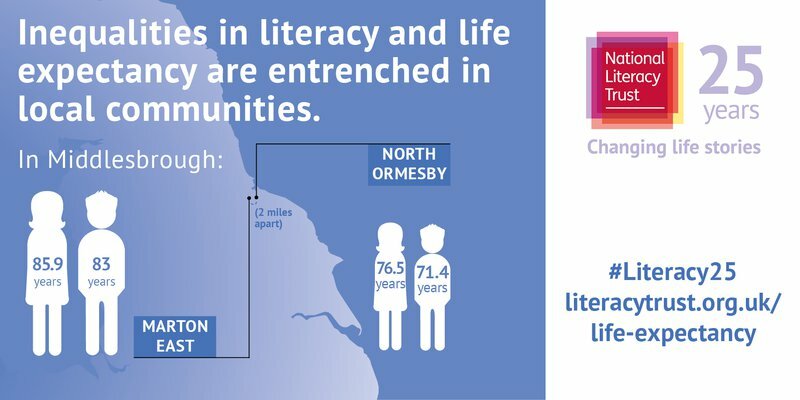 In Middlesbrough, one of the most deprived areas in the country, a boy born in the ward of North Ormesby (decile 1 for literacy vulnerability) has a life expectancy of 71.4 years, which is 11.6 years shorter than a boy born just 2 miles away in Marton East (decile 8 for literacy vulnerability) who has a life expectancy of 83 years; the gap is 9.4 years for girls (76.5 years vs 85.9 years). Find out more about our 25th anniversary.